There are few movies when you have prominent actors of that genre collaborate together. It’s always fun to see Leslie Nielsen working together with Mel Brooks or seeing any Quentin Tarantino/Robert Rodriguez combination. So who would turn down the chance to go see Grudge Match? The film stars two prominent actors (of action, especially boxing) Sylvester Stallone and Robert De Niro, as well as Kevin Hart, Alan Arkin and Kim Basinger. 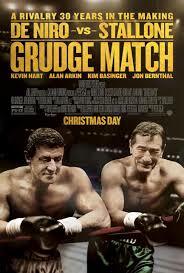 The movie follows Razor Sharp (Stallone) and Kid McDonnen (De Niro) as two aging boxers who are trying to prove once and for all who is in better shape, and ultimately, who is the better boxer. Wait, what? Hold on, didn’t Stallone and De Niro both make a movie (or franchise) about being boxers when they were younger and in actual physical shape? Yes, at first, I walked in expecting there to be a bunch of Rocky vs. Raging Bull jokes (the fact they had hanging cows in the trailer didn’t help) and that the entire movie would consist of one-liners trashing each other’s characters and previous movies. Instead, it was a completely different story. It revolved more on the personal aspects of the two aging boxers in that Razor has a lost love Sally (Basinger) and Kid has a son (Jon Bernthal) he just met. As the story continues on, Dante Slate Jr. (Hart), the son of former boxing promoter Dante Slate who set up the original two matches between Razor and Kid. Since the two boxers each won one and lost one in the previous two matches, they also had incentive to have the match as well. Team Louis Conlan (Arkin) up Razor as his right hand man, you’re sure to expect some hilariously awkward moments when a sexual joke is made but it becomes funnier when added to the fact that Conlan is in his eighties and has a high-pitched hearing aid buzzing at his ear. Bernthal comes along to play Kid’s son BJ (cue the sexual innuendoes in front of a 6 year old kid BJ has), who ultimately ends up training Kid after Frankie Brite (LL Cool J) appears (in a bit more than a cameo ) as the owner of the famous gym where boxers get their start. Of course, we see some drama here between Kid and Frankie since Kid gave Frankie his start and now is being turned down by him. What makes the film different from other boxing movies (as well as films overall) is that it relies heavily on the use of modern technology to get the plot moving along. It’s a constant back and forth between the two characters as they argue on whether they should fight, and their entire match escalates from a small venue to a huge Madison Square Garden-esque fight all due to the use of modern technology. The two are brought together by Dante to film a video game, then that gets heated and it goes viral (hence the trailer) and from then on, the plots picks up with more technological uses. Of course, the plot could be guessed right away. Razor is in love with Sally who secretly has a son BJ who is secretly Kid’s son who needs a trainer. And the ending is just more obvious because when one of the characters is painted to be more despicable than the other, you can guess the one with an obstacle he has to overcome will win; it’s just the way movies work nowadays. If there was one reason you needed to go see the movie, go for Kevin Hart. He steals every scene he’s in and makes the movie so much more hilarious. Alan Arkin does a great job of being a horny senile old man but I felt the relationship between Sally and Razor was a bit forced and the former was just reading off a script to get the scene done. So I personally would wait until DVD or when it comes on tv, but if you’re looking for a quick laugh, go see it.